“35(1) The existing aboriginal and treaty rights of the aboriginal people in Canada are at this moment recognized and affirmed. 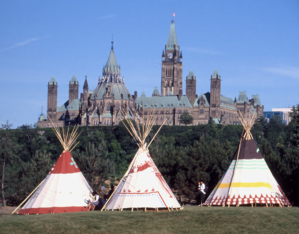 The patriation of the Constitution in 1982 to include Indigenous or Aboriginal rights from a constitutional perspective set the stage for the Supreme Court of Canada to begin to weigh in on issues related to Indigenous rights and title. The underlying belief was that once treaty and Indigenous rights were recognized in the Constitution as “constitutional rights” that recognition provided a legal status protecting Indigenous rights and title. It’s been over three and a half decades since the Constitution included Indigenous rights and Indigenous Peoples are still bearing the financial and emotional brunt of having to prove and defend their rights in the courts. On the other side of the coin, the ensuing lack of certainty about Indigenous rights and the duty to consult is hampering investment in resource development projects, and some claim, impacting the national economy. When an infrastructure project such as Trans Mountain Pipeline Expansion is halted due, in part to inadequate consultation with Indigenous Peoples, there are those who claim that the interests of Indigenous People have a negative impact on the country as a whole. I disagree as Indigenous rights are part of our Constitution and therefore honouring their rights is in the interests of all Canadians. The judge’s comments point out that the NEB representatives were there to take notes and pass the information along to those who had the authority to make decisions, ergo there wasn’t any actual consultation nor any accommodation. The judge, rightly, took issue with the notetaking vs consultation aspect of the process. As described by Justice Dawson, meaningful consultation means listening to Indigenous Peoples concerns, discussing their concerns, and being prepared to accommodate those concerns. It is much, much more than note taking. Either way it wastes the valuable time of the community representatives, and can give an organization a black eye regarding working successfully and effectively with the community to get a project approved and into operation. It’s always good to remember that a community can tie the project up in the courts for years which is immensely costly in both legal and project delay costs and can impact investor confidence. If you're interested in learning more about Aboriginal rights, title and the duty to consult, download our free ebook.